Like it says, here’s what’s new in. There’s some everyday aero wheels from 3T, a big pile of snazzy hydration packs from Camelbak, one of the world’s best road groupsets and a friendly warning that we’re nearly out of PR7 road bikes. Welcome to part 10 (ten!) of What’s in the Shop where we see what’s hot and what’s on offer in our new showroom right now. We have some serious deals on at the minute so if you’ve got some cycling pocket money just dying to be spent then right now you could get a lot of gear for your money. 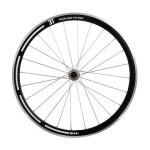 Available in Shimano or Campagnolo fittings 3T describe these wheels as the first everyday aero wheel. Aero wheels are quite often seen as too much of an expense for most people. Even though they are beneficial, saving you time in a race, they are out of reach to a lot of cyclists. Well at this price your dream of faster times can be achieved without breaking the bank so snap them up while you can. The 3T Accelero pro 40 wheelset is at 56% off. That’s right, these wheels should have been £449.99 but are now available to you at £199.99. Gone are the days where all people carry water bottles, now a lot of riders seem to prefer the Camelbak and who can blame them? 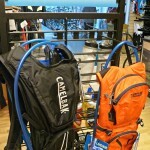 Everyone loves a Camelbak (well, a lot of people do anyway) and now we have some end of line stock at up to 42% off. We have a variety of sizes so whether you’re off for a few hours or out all day we’ve got something to suit you. As is the way with Camelbak there’s a real mix of in-yer-face bright colours and more subdued blacks and greys colour schemes. SRAM Red 22 is the lightest group out there so team this up with a great frame and you could have a lightweight race bike for a fraction of the RRP. Talking of custom builds (ahem) we do have a selection of carbon frames in store that are just gagging for Red 22. Why not ask for quote today? Always wanted a top of the range groupset but didn’t quite have the cash to get one? 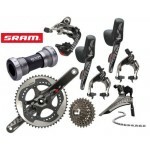 SRAM Red 22 with 53% off RRP which puts it at just over £1000. That’s a huge saving over its rivals Shimano and Campag and it’s the groupset of choice for Alberto Contador and Mark Cavendish. New in this week we have a range of waterproofs from DexShell. 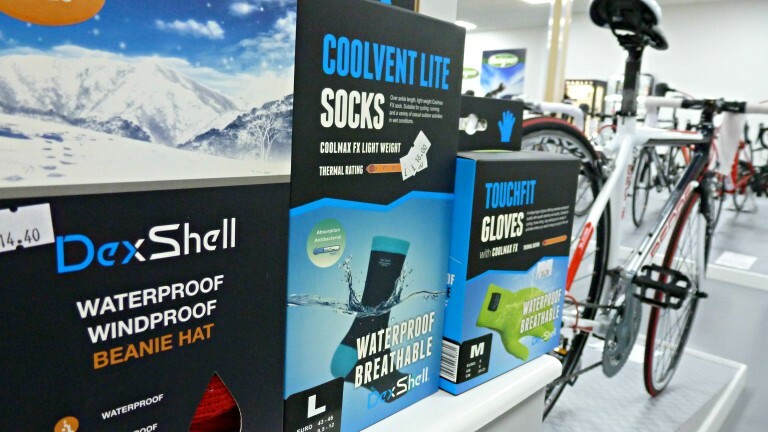 We have socks, gloves and hats to choose from and you’d never guess they were waterproof until you look at the label. The new designs look every bit like “normal” cycle wear in an attractive woolly finish but with an added bonus of keep you warm AND dry. Check them out. This baby again. Basically, they’ve nearly all gone. 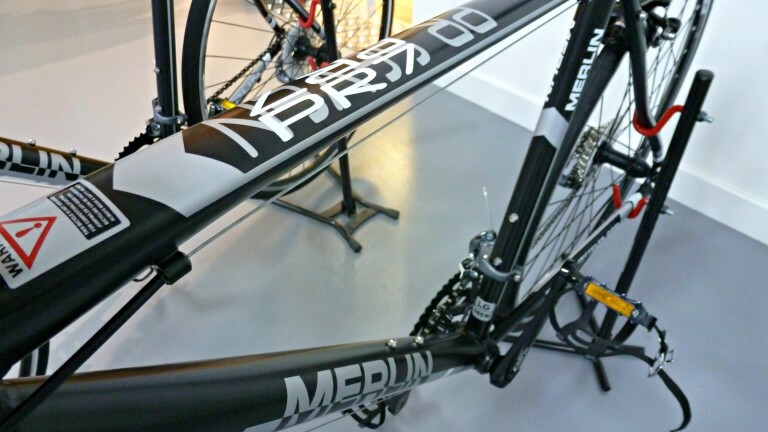 We’ve really enjoyed all the great feedback about our recent edition of the Merlin Performance PR7 Road and that feedback has seemingly gone viral as we’ve nearly sold out. Despite ordering a truck load of these budget beauties you’ve loved them so much that we’re nearly out in only two months. If you want what we think is the best entry level bike out there then get over to our shop or website – quick! Tagged 3t, aero wheels, camelbak, dexshell, pr7, red 22, sram red 22, waterproof socks. Bookmark the permalink.